Roundabouts are safer than intersections because they reduce the number of potential conflicts between road users and lower the driving speed. In the Netherlands, replacing an intersection by a roundabout is estimated to reduce the number of severe casualties by approximately 46%. The traffic flow is usually better on roundabouts than on intersections, and exhaust emission and noise decrease, certainly when compared with signalized intersections. Roundabouts, however, take up more space. There has been discussion for a long time already about whether it is safer or less safe for cyclists and moped riders to have priority on roundabouts with separate bicycle tracks. Roundabouts with priority for cyclists appear to be less safe, but due to mobility reasons cyclists and moped riders generally have priority on Dutch urban roundabouts. Homogenous use of the infrastructure is one of the Sustainable Safety requirements. On urban main road intersections, where all traffic types meet, this homogeneity requirement translates into reduction of the number of potential conflicts and lower driving speeds. Roundabouts meet this requirement because of their features. The roundabout was introduced in the Netherlands about thirty years ago. According to the Dutch National Road Register (NWB) there were about 3,900 fully fledged roundabouts in the Netherlands in 2010. Approximately 1900 of these roundabouts have a diameter of between 20 and 30 m; roundabouts with this diameter are generally single-lane roundabouts. About three-quarters of the 3,900 roundabouts can be found on municipal roads. Since the introduction of roundabouts, various aspects have been subject to discussion: the priority regulation for traffic on the roundabout, the various types of roundabout, and the priority regulation for separate cycle paths - are cyclists safer with or without priority? In a road network, intersections are the links between different roads. The flow function on intersections is generally subordinate to the exchange function (see the archived SWOV Fact sheet Functionality and homogeneity). In principle, intersections on distributor roads - i.e., urban and rural through roads with speed limits of 50 and 80 km/h respectively - are usually intersections at grade. Therefore, on these roads there are more conflicts at intersections than on road sections which are characterized by large differences in direction, speed, and mass. In addition, road users face a more difficult driving task because of the more complex traffic situation at an intersection. In a brief moment drivers have to make decisions about their route, steer their vehicle, and also allow for (unexpected) manoeuvres of other road users – see also the SWOV Fact sheet Types of junctions. To which extent are roundabouts responsible for unsafe situations at intersections? During the period 2006-2009, 44% of all registered traffic casualties (fatalities and serious road injuries) in the Netherlands can be attributed to intersection crashes. More than three quarters of these casualties are in crashes at urban intersections. Only a very small proportion of these casualties are in crashes at roundabouts. However, the exact proportion is unknown as, although the number of roundabouts is known (see above), the number of intersections is not. According to an estimate (Slop, 1995) there are approximately 300.000 intersections in the Netherlands, of which (only) several thousands are at locations comparable to those where roundabouts are found. What types of roundabout are there? There are different types of roundabout. The most important types are the single-lane roundabout and the two-lane roundabout; in addition, a special type of two-lane roundabout is the so-called turbo-roundabout. As the name indicates, single-lane roundabouts only have one driving lane. If there is much vehicle traffic a second lane is needed, thus resulting in a two-lane roundabout. At two-lane roundabouts there are sometimes conflicts due to weaving. This problem is solved by the turbo-roundabout which makes it possible to exit the roundabout without conflicts with other vehicles. Table 1. Rules of thumb for roundabout capacity (CROW, 1998). each segment has one single lane on which traffic can choose whether or not to leave the roundabout. For long vehicles such as lorries and buses, roundabouts can be an awkward obstacle. This must be allowed for in the design of the roundabout, particularly on roads with a lot of freight traffic. For geometric design characteristics of the various roundabout types we refer to the Dutch guidelines (CROW, 1998; 2002a and 2002b; 2008). [i] Danger of one vehicle being obscured by another: if traffic on the one traffic lane hinders the crossing traffic's view on the other traffic lane, thus increasing the risk of a crash when crossing over. What road safety effect do roundabouts have? A roundabout reduces the number of potential conflicts at an intersection and ensures that, in addition to less serious rear-end conflicts, only one (lateral) conflict type remains (see Figure 2). A roundabout also reduces the approach speed of traffic. The correct approach speed is approximately 30 km/h because in many cases crashes between motor vehicles and pedestrians or cyclists end without fatal injury at this speed (Wegman & Aarts, 2006). However, in order to guarantee this approach speed the roundabout should meet the specific design requirements regarding the consecutive bends that motor vehicles have to follow when approaching and driving on a roundabout. The current requirements (CROW, 1998) use an approach speed of about 35 km/h. CROW (1998) provides arithmetical directions for designing a roundabout with lower approach speeds. Figure 2. Potential conflicts on various intersection types. Various studies have been carried out in the Netherlands about the safety effects of replacing an intersection by a single-lane roundabout (Van Minnen, 1990; 1995; 1998; Dijkstra, 2005). Churchill et al. (2010) evaluated the effects of approximately 2000 roundabouts that were constructed during the period 1999-2005. They found a 76% reduction of the number of fatalities and a 46% reduction of the number of serious casualties (fatalities and serious road injuries). These reductions are smaller than those found by Van Minnen (1998). The roundabouts in the latter study, however, had been constructed much earlier. These roundabouts probably replaced intersections that were much more dangerous than those that were replaced by roundabouts that were constructed during the more recent period. Elvik (2003) studied 30 before-and-after studies about roundabouts from various countries, made corrections, and found an average net effect of 30-50%. Fortuijn (2005a) studied the effects of replacing 58 intersections by 51 single-lane roundabouts and seven turbo-roundabouts on provincial roads in the province of Zuid-Holland. All roundabouts had separate bicycle tracks and had no priority for cyclists. The study showed a decrease in the number of injury crashes (including those with slight injury) of more than 80% on both single-lane and two-lane roundabouts. After correcting for the 'diminishing safety returns' described above, the percentage decreases to 70%. What are the mobility and pollution effects of roundabouts? The flow of traffic on a roundabout is determined by the amount of traffic on the approach roads. A well-balanced distribution over these roads ensures a good traffic flow. With a steady arrival of vehicles, a roundabout can have a shorter waiting time than a signalized junction. On intersections with unequal volumes, roundabouts can have a longer waiting time at certain access ramps. During the quiet hours, roundabouts have hardly any waiting time. It is not possible to give priority to a particular approach road by, for example, lengthening its green light time; which is possible at an intersection. In general, the waiting time for cyclists and pedestrians is shorter on a roundabout, even without priority, than at signalized junctions. According to Hydén & Várhelyi (2000) the exhaust emission increases by 6% for CO and 4% for NOx when a priority intersection is replaced by a roundabout. When a signalized intersection is replaced, the emission goes down by 29% for carbon monoxide CO and 21% for nitrogen oxide NOx. The noise emission decreases in both cases. For which road types are roundabouts suitable, and is that where they are? In principle, roundabouts are constructed at intersections of distributor roads both at urban and rural locations. Roundabouts are also constructed at other locations, but are then less functional. Roundabouts cannot be constructed everywhere; lack of space is often a factor here. Furthermore, using a roundabout must be logical at the structural level, and the intended section speed must be taken into account. With regard to the homogeneous traffic flow, a distributor road may not have too many connections. A roundabout cannot be used at very large traffic volume (see Table 1), or when there are large differences in volume between the approaching traffic flows (which hinders traffic from other directions accessing the roundabout. Doumen & Weijermars (2009) have found that in the Netherlands, the construction of roundabouts at potentially desirable urban locations has not yet been completely realised; this backlog is even larger for rural distributor roads. What is safer, priority or no priority for cyclists on separate bicycle tracks on a roundabout? 'Voorspelbaar gebruik' is een eis voor infrastructuur binnen Duurzaam Veilig. Deze eis hangt nauw samen met ‘herkenbaarheid’ en ‘uniformiteit’. Op dit gebied laten rotondes nog wat te wensen over. Naast de verschillende vormen van rotondes zijn er ook verschillen in het type fietsvoorziening en in het type voorrangsregeling voor fietsers op vrijliggende fietsvoorzieningen. Omdat rotondes met vrijliggende fietspaden een aanzienlijk lager aantal slachtoffers per rotonde hebben dan rotondes met fietsstroken, raadt Van Minnen (1995) de toepassing van fietsstroken op rotondes af. Om uniformiteit in de voorrang op rotondes te bewerkstelligen beveelt het CROW (1998) aan om fietsers op vrijliggende fietsvoorzieningen langs rotondes buiten de bebouwde kom geen voorrang te laten hebben op het gemotoriseerde verkeer, en op rotondes binnen de bebouwde kom wel. Op bijna alle rotondes buiten de bebouwde kom zijn fietsers nu 'uit de voorrang'. Binnen de bebouwde kom is de voorrangsregeling voor fietsers op zo’n 60% van de rotondes conform de CROW-aanbeveling. Volgens CROW (1998) blijken rotondes met fietsers in de voorrang "iets minder veilig" te zijn dan rotondes met fietsers uit de voorrang. Dijkstra (2005) geeft meer zicht op de omvang van dat "iets minder": tussen de 52 en 73 extra ziekenhuisgewonden per jaar. Fortuijn (2005b) concludeert dat het aantal letselongevallen op rotondes met fietsers in de voorrang ruim tweemaal zo hoog is als op rotondes met fietsers uit de voorrang. Het feit dat het CROW de aanbeveling doet om fietsers voorrang te geven, heeft niet met deze veiligheidskwestie te maken maar met mobiliteitsargumenten pro fiets. Dijkstra (2005) noemt twee mogelijke verklaringen voor het feit dat rotondes met fietsers in de voorrang onveiliger zijn dan rotondes met fietsers uit de voorrang. Ten eerste zouden automobilisten ten onrechte menen voorrang boven de fiets te hebben, wellicht in verwarring gebracht door het gebrek aan uniformiteit van de voorrangsregeling op rotondes. Bovendien zouden automobilisten op een rotonde (te) veel waarnemingen in korte tijd moeten uitvoeren, waardoor een fietser te laat wordt opgemerkt. De SWOV ging in 1998 akkoord met de aanbeveling ‘fietsers in de voorrang’ mits de CROW-aanbevelingen voor de vormgeving van rotondes opgevolgd zouden worden. De SWOV verwachtte dat rotondes met een dergelijke vormgeving daadwerkelijk veiliger zouden zijn. In de praktijk blijken rotondes lang niet altijd volgens deze aanbevelingen te zijn vormgegeven. Als dit wel het geval is, blijkt er bovendien geen veiligheidswinst op te treden (Dijkstra, 2005). What are the costs and benefits of constructing a roundabout? We estimate that the costs of converting an intersection into a single-lane roundabout are approximately €400,000 (Wijnen et al., 2010). These costs vary with the roundabout's size. 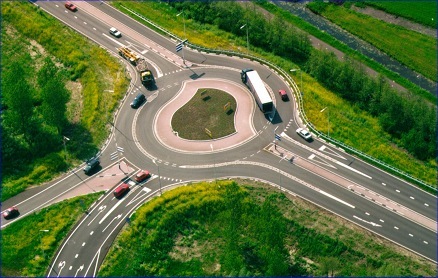 The costs of a two-lane roundabout are approximately €600,000 (DHV, 2000). It remains to be disputed whether all costs of a conversion should be attributed to road safety. Roundabouts also benefit the traffic flow. The social benefits of a roundabout may be derived from the number of casualties that are prevented. This number covers the entire period during which a roundabout remains functional; this period is generally considered to be thirty years. Churchill et al. (2010) found that the 2000 roundabouts that were investigated, saved 102 serious casualties in the year 2006. The casualties saved can be can be used to calculate the saving over a thirty year period; see archived SWOV Fact sheet Cost-benefit analysis of road safety measures. The saving will amount to 1,515 serious casualties. Over this thirty year period an amount of about 1,27 billion euros can be saved on the social costs of those casualties; see SWOV Fact sheet Road crash costs. If the costs per roundabout are 400,000 euros, the benefit-cost ratio is 1,57. If one takes account of the fact that not all costs are road safety costs, the benefit-cost ratio will be more favourable. Dijkstra (2005) has shown that changing the priority regulation for cyclists from priority to no priority (mainly by adapting the road markings) also leads to a favourable benefit-cost ratio. A roundabout reduces the number of conflicts at an intersection (see Figure 2) and leaves only the lateral conflicts. A roundabout also reduces the speed of approaching traffic. During the period 1999-2005, the conversion of intersections into roundabouts led to a reduction of about 46% in the number of severe casualties. On rural roads, replacing an intersection, either a priority intersection or a signalized one, by a single-lane roundabout led to a 70% reduction in injury crashes, including those with slight injury. This reduction of 70% in injury crashes can also be assumed valid for turbo-roundabouts. It is necessary to take the mobility effects and extra space needed into account. The pollution effects, i.e. harmful exhaust emission and noise, are positive if a roundabout replaces a signalized intersection. When a roundabout replaces an unsignalized intersection, the result is slightly more exhaust emission, but less noise hindrance. The conversion of an intersection into a roundabout is cost-effective, as is changing priority for cyclists into no priority. There is no consensus about the priority regulations for cyclists on roundabouts with separate bicycle tracks. CROW recommends priority for cyclists on urban roundabouts, but no priority on rural roundabouts. However, from a road safety perspective cyclists should have no priority on urban roundabouts either. Churchill, T., Stipdonk, H. & Bijleveld, F. (2010). Effects of roundabouts on road casualties in the Netherlands. R-2010-21. SWOV, Leidschendam. CROW (1998). Eenheid in rotondes. Publicatie 126. CROW Kenniscentrum voor verkeer, vervoer en infrastructuur, Ede. CROW (2002a). Handboek wegontwerp – Gebiedsontsluitingswegen. Publicatie 164c, CROW Kenniscentrum voor verkeer, vervoer en infrastructuur, Ede. CROW (2002b). Fietsoversteken op rotondes: supplement bij publicatie 126 'Eenheid in rotondes'. Publicatie 126a. CROW Kenniscentrum voor verkeer, vervoer en infrastructuur, Ede. Doumen, M.J.A. & Weijermars, W.A.M. (2009). Hoe Duurzaam Veilig zijn de Nederlandse wegen ingericht? Vragenlijststudie onder wegbeheerders. D-2009-5. Stichting Wetenschappelijk Onderzoek Verkeersveiligheid SWOV, Leidschendam. Elvik (2003). Effects on road safety of converting intersections to roundabouts. In: Transportation Research Record 1847, p. 1-10. Transportation Research Board, Washington D.C.
Fortuijn, L.G.H. (2005a). Veiligheidseffect turborotondes in vergelijking met enkelstrooksrotondes. In: Verkeerskundige werkdagen 2005, Ede, 31 p.
Fortuijn, L.G.H. (2005b). Voorrangsregeling fietsers op rotondes; Overzicht van gegevens uit Nederlandse studies sinds 2000. In: Verkeerskundige Werkdagen 2005, Ede, 22 p.
Hydén, C. & Várhelyi, A. (2000). The effects on safety, time consumption and environment of large scale use of roundabouts in an urban area: a cast study. In: Accident Analysis & Prevention. Vol. 32, nr. 1 p. 11-23. .
Minnen, J. van (1990). Ongevallen op rotondes; Vergelijkende studie van de onveiligheid op een aantal locaties waar een kruispunt werd vervangen door een "nieuwe" rotonde. R-90-47. Stichting Wetenschappelijk Onderzoek Verkeersveiligheid SWOV, Leidschendam. Minnen, J. van (1995). Rotondes en voorrangsregelingen. Verslag van een drietal onderzoeken: de ontwikkeling van de veiligheid op nieuwe rotondes, het wijzigen van de voorrang op oudere pleinen en de regeling van de voorrang voor fietsers rond rotondes. R-95-58. Stichting Wetenschappelijk Onderzoek Verkeersveiligheid SWOV, Leidschendam. Minnen, J. van (1998). Rotondes en voorrangsregelingen II; Uniformering voorrangsregeling op oudere pleinen, veiligheid fietsvoorzieningen en tweestrooks rotondes. R-98-12. Stichting Wetenschappelijk Onderzoek Verkeersveiligheid SWOV, Leidschendam. Slop, M. (1995). Kostenindicatie opheffing voorrang gemotoriseerd verkeer op niet-gemotoriseerd verkeer. R-95-13. Stichting Wetenschappelijk Onderzoek Verkeersveiligheid SWOV, Leidschendam. Wijnen, W., Mesken, J. & Vis, M.A. (2009). Effectiviteit en kosten van verkeersveiligheidsmaatregelen. R-2010-9. SWOV, Leidschendam. SWOV (2012). Rooundabouts. SWOV fact sheet, January 2012. SWOV, Leidschendam.